So, it’s no surprise that the best solutions are designed close to where they’re most needed. How do you empower people in remote parts of the world to develop their own solutions? How can their best solution be shared globally with others to maximize the benefit? Floods and mudslides regularly devastate El Salvador. Villagers can identify impending floods and mudslides, but they are unable to warn others in time. Rugged terrain, lack of power and cellular networks present a formidable communication challenge. Reacción, a team of El Salvadorian experts in electronics, community development and disaster relief, decided to do something about it. Working with local villagers and global experts, they developed an IoT-based early warning system for disasters that’s now shared globally. Reacción surveyed rural farmers and village elders to understand their concerns. They soon realized that a system that relied only on automated sensors wouldn’t be adequate. Instead it had to incorporate input from village elders who had experience in identifying signs of natural disasters. The solution also had to be battery powered, rugged, affordable and simple enough for villagers without formal education to use. A team of villagers and experts in community development, data analysis, disaster risk reduction, electronics and open design methodologies was assembled to design the solution. They adopted a design thinking approach to brainstorm on designs that would meet the technical requirements and also fit with existing village dynamics. This helped ensure that the final offering would be widely adopted across El Salvador. The Reacción team worked with the local FabLab to develop a prototype. This organization is the brainchild of Professor Neil Gershenfeld at the Massachusetts Institute of Technology (MIT). These labs are found around the world and "solve local problems with local actors through technological innovation and the use of digital manufacturing tools." Their Early Warning System lets villages alert each other even when power and phone communications have been disrupted in a natural disaster. Villagers alert others through a simple battery-powered device that has color-coded buttons to indicate an impending danger, as well as its severity. Reaccion found that even villagers without formal education could easily use the color-coded buttons. The device supplements human input with IoT weather sensors and accelerometers to measure tremors. The devices connect villages with a radio-signal powered mesh network. GPRS links are used to connect the mesh network to the cloud for additional data analysis of weather conditions and natural disasters. 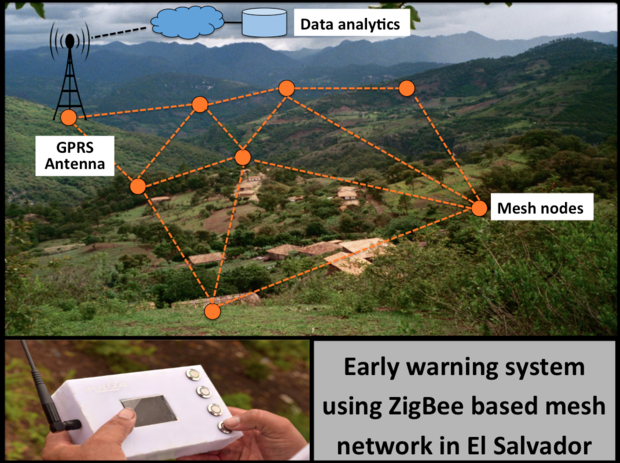 Reacción connects villages with an Early Warning System through a mesh network where each village has its own alerting device, which becames a node in the mesh. The devices store and update information across the mesh network in a peer-to-peer (P2P) manner. A high-capacity network would be overkill, as the devices are only meant to be used in the event of a disaster. A mesh network is a network topology where all of the nodes cooperate in the distribution of data in the network. A message is propagated by hopping from node to node until it reaches its destination. Mesh networks offer more than one path between a source and a destination, making them highly reliable. Traffic is rerouted around a broken node, such as a village whose device isn’t working properly. Reacción chose ZigBee radio circuits from Digi International because they can spontaneously organize themselves into a mesh network. The devices save power by synchronizing transmission and reception and turning off radios when they aren't being used. Each device has a radio antenna and is aware of the alert status of all the other devices on the mesh network. A mesh network can affordably connect villages scattered across rugged mountainous terrain. The XBee-PRO DigiMesh transmits over a mile with a clear line of sight. In El Salvador, however, the transmission range is reduced due to trees and mountains. So, the villagers set up their mesh network nodes at higher elevations to overcome these obstacles, and they use multiple IoT devices to strengthen the network signal. Open source: Distribute your design as open source. Reaccion’s Early Warning System design is freely available on GitHub. 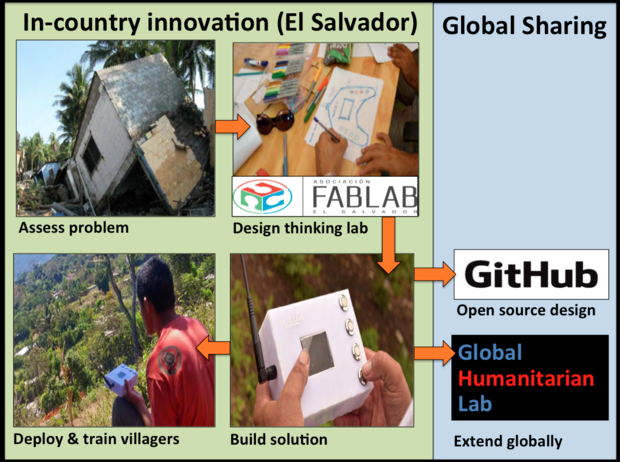 Global Humanitarian Lab (GHL): Engage with GHL. This is a joint initiative between public, private and academic organizations to promote collaboration for the development and distribution of humanitarian solutions. It supports grassroots innovators with global experts and the maker community to incubate, make and accelerate products and processes. GHL is supported by the International Committee of the Red Cross (ICRC), UN High Commissioner for Refugees (UNHCR), IKEA Foundation, Vodafone Foundation, and the Center for Bits and Atoms at MIT (CBA MIT). FieldReady: Collaborate with this non-profit group that enables communities affected by disaster to locally manufacture lifesaving supplies with 3D printing and open-sourced designs. Their approach overcomes the challenges of slow and expensive humanitarian supply chains. FieldReady_Nepal_v3_720p from Field Ready on Vimeo. Developing solutions to meet local problems requires empathy, expertise and community collaboration. Regardless of who invented it and in what country it was first used, it makes sense to share the benefits of humanitarian innovation globally.